The Crown Imperial Court is a luxurious and homely apartment located in Brinchang town, Cameron Highlands. Here is where you will enjoy some of the best facilities with top-class equipment which will make your stay in Cameron Highlands more rewarding and fulfilling. Staying at the Crown Imperial Court apartments will be worth your money because it comes with all new furniture and fitting amidst the beautiful and serene surroundings. From the balcony, you get some of the most breath-taking views of Cameron Highlands that oversee the Brinchang town centre and the lush mountains beyond. At night, the infamous Brinchang Night Market comes alive where you can experience the usual lifestyle of the people here. From here, you can easily reach top attractions around Cameron Highlands on foot. Staying at the Crown Imperial Court means you are in the middle of places like the Pasar Malam, Cactus Valley, the Big Red Strawberry Farms while commercial areas like the mini market, convenience stores, banks and restaurants are all about 2 to 3 minutes-walk away. You will be welcomed with a 3-bedroom and 2-bath unit at the Crown Imperial Court apartment which is accessible via a dedicated lift. Wi-Fi internet access is provided at no extra charge with LCD TV equipped with satellite services that include Astro HD and Sports channels. For those who like recreation, the Mahjong table and chairs here can be used at your discretion. If required, you can have extra pillows and mattresses with no additional costs. Each room comes with ceiling fan and hot water-heater supply in the bathrooms. The kitchen is fully equipped with new electrical appliances and cooking facilities. You can even use the steamboat equipment here. Just buy the fresh foods from the market downstairs and have an enjoyable time with your friends and families. Please call 0126725888 for booking. 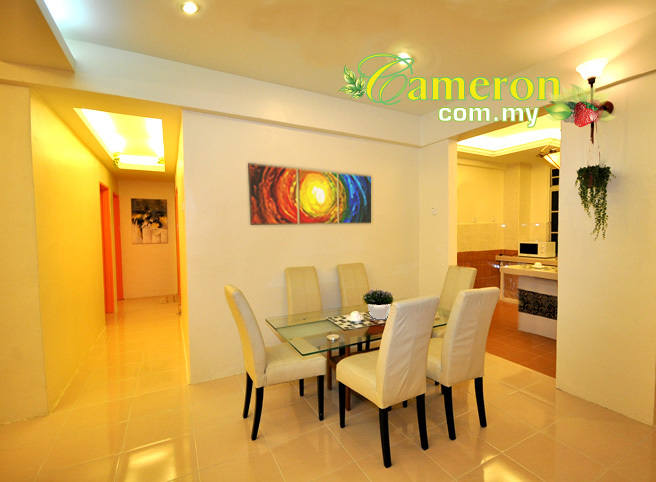 Crown Imperial Court is the best choice for premium apartments in Cameron Highlands. If you like to shop, head out to the night market or pasar malam which come alive when dusk breaks. The night market offers and put up the freshest goods for sale here on a daily basis. You will be able to buy the freshest vegetables that come directly from the farms. Apart from that, fresh strawberries, honey from the bee farms, tea produce and such too are available at affordable prices. The night market is situated within walking distance of the apartments which mean that you just have to take the lift downstairs, towards the front door and you are there. With years of experience in the building and construction industry, the developer draws its expertise to build this new landmark in Cameron Highlands. Using only the best and imported material from all parts of the country, you can rest assure that your apartment unit is completed and built with the best quality and standards. With new housing options springing up in Cameron Highlands due to its nice cooling weather, the Crown Imperial Court apartments would be one of your most ideal choices around. You need not have to wait long to move in because the keys have since been handed over to its rightful owners and the CF (Certificate of Fitness) will be ready at anytime. There are many types of apartments here in Crown Imperial Court apartments and you can choose from a wide range of choices. Prices starts from RM290k which makes it affordable and not too overly price. Whether it is for investment, as a vacation home or for your family, Crown Imperial Court gives you the ideal opportunity to own one of the most promising and prestigious piece of property in Cameron Highlands. There are basically 4 blocks of apartments here where Block A is the most prominent and exclusive block. This is where the apartment faces the front entrance, giving you the best and most convenient access to the surrounding amenities. However, this do not mean that the other 3 blocks are less exclusive. The difference is that they are situated on the rear but is as easily accessible as Block A. Being higher in terms of population, you will also enjoy up to 4 lifts in each of the 3 blocks which is not available in Block A. To get into the apartments the front entrance is located just beside Petronas Station of Brinchang which faces the main road. This is where you will be able to walk towards the shops and stores nearby the station. There is however an alternative entrance and exit on the opposite side of the apartment which gives you another access to other parts of Brinchang town. As with most property in Cameron Highlands, coupled with the strategic and exclusivity of Crown Imperial Court Apartments, you can be assure that returns on your investment would increase every year. This is a proven fact with property in Cameron Highlands and hence you will surely enjoy the returns if you are investing in the property. However, if you are buying it to stay here, you can also be more than happy to know that your property is very much demanded in the market. As owners of any unit in Crown Imperial Court apartments, you can also choose to rent your unit to the developer or the hotel management who will lease out the unit to any type of inquiries or needs of tourists and visitors to Cameron Highlands. As part of the exchange, you will enjoy up to 10 days of free stays in your own unit each year. With such demand and the rising cost of property in Cameron Highlands as well as around the country, all the units in Crown Imperial Court Apartments have since been sold.